The equipment your lifeguards have will dictate their ability to help in an emergency. Lifeguards are there to help protect everyone in the water. However, even the best lifeguard can’t always be effective if he doesn’t have the proper equipment on hand to help those who need it. If you need lifeguards to work for you at your pool or beach, it is important to make sure they have all the proper equipment. Even if you don’t supply the lifeguard suits, there are some things you should provide so everyone can stay safe. 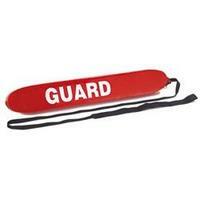 A lifeguard is going to want to have everything he needs in easy reach, especially when there is an emergency. This is where a lifeguard fanny pack can work to your benefit. 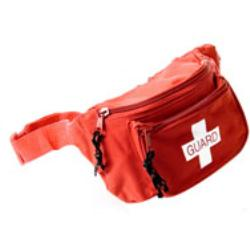 This fanny pack will advertise that you are the one to turn to for help, while providing you storage space for everything you may need in an emergency. It won’t hold larger items, but it is still an important tool to have with you at all times. Perhaps one of the most important tools a lifeguard can keep close by is the lifeguard first aid kit. Available in a wide range of sizes, you can find one that will best fit your needs. For instance, if you work a busy beach, you may want a much larger kit than if you were a guard at a small private pool with few swimmers. These kits often contain everything you need for minor injuries, including bandages, antiseptic ointment, gloves, adhesive tape and more. 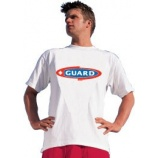 Other important equipment for your lifeguards can include a lifeguard rescue tube and a guard backboard. Both of these items can be incredibly useful in emergency situations. The lifeguard rescue tube makes those difficult water rescues easier by providing buoyancy to the person being rescued, which makes it easier to tow the person in. A backboard is necessary in case of back or neck injuries sustained in a pool or other body of water. Making sure your lifeguards are well-equipped for every emergency. No one wants anything bad to happen, but when you are around water and have swimmers of various experience levels, things can happen. It is important to make sure your lifeguards have everything they need to help. It is up to you to make sure your guards have all the lifeguard equipment they need, whether you will be buying the equipment or they will. someone manning the lifeguard stand at the public pool will need different rescue equipment than those on duty at a beach. It’s important to keep a checklist of the essential items you need to lifeguard and ensure they’re near lifeguards at all times. Many young teens take jobs as lifeguards, so if you’re in charge of a group of young people working as lifeguards, go over rules with them regularly to ensure the public’s safety. 1. Two way radio. – For lifeguards working a at a lake or beach a two way radio is required. This ensures there’s contact to emergency rescue services if a lifeguard needs assistance. Depending on the lifeguard’s work experience, it may be required to call for emergency rescue services every time a lifeguard rescues someone. This puts trained medical personnel on the scene in case the victim needs assistance after he or she is rescued. Two way radios should be tested regularly to guarantee they work. Extra batteries should never be far behind the two way radio. A cell phone should also be with lifeguards, although sometimes two way radios pick up better signal than a phone if you’re in a rural area. 2. Rescue Tube – A rescue tube is essential for any lifeguard rescue equipment stash. The rescue tube is the tube you every lifeguard with. Many walk up and down the beach with them, just in case they were to need them. The rescue tube has shown to be one of the most effective pieces of lifeguard rescue equipment than lifeguards use. They should be on the checklist for any pool, lake or ocean. The rescue tube works in any body of water and aids a lifeguard as he or she is bringing the victim back to the surface. 3. CPR mask. – A CPR mask that does not require assembly should be essential for any lifeguard. This shaves seconds off getting the mask on the victim, which can be valuable when you are in an emergency. A CPR mask prevents the lifeguard from having direct contact with the victim, while appropriately distributing air into the victim’s mouth during CPR. Lifeguard rescue equipment that is functional and helps a lifeguard approach an emergency with ease are the most effective pieces you can stock. All lifeguard should be trained on the job (in addition to holding lifeguard certification) with equipment. Many swimming pools are about to open for the summer swim season and they need to make sure that they have all of the necessary rescue and lifesaving equipment on hand. One of the most important items for swimming pools to have is the lifeguard backboard or spineboard. This rescue backboard is required for all swimming pools to have on hand. There are many styles to choose from but we have found a cheap life guard backboard that will fit into every pool’s budget, the Pro-Eco Spineboard. The lifeguard Pro-Eco backboard has a seamless design that prevents any fluid contamination and a 500lb weight capacity, plus it is UV stable which makes it perfect for outdoor swimming pools. The Rapid Deployment Products Pro-Lite Spineboard is the best choice for swimming pools. This new spine board has an unlimited weight capacity and is made of lightweight, one-piece x-ray translucent polyethylene plastic with molded-in pins, and it is also UV stable. Why the Pro-Lite Spineboard and not different spine board? Because there is a 100% guarantee for the life of the spineboard under normal conditions, plus it is guaranteed not to warp for the life of the spineboard. Don’t mess around with those wood backboards that you are needing to replace every couple of years We recommend the use of backboard head immobilizer with this lifeguard spine board. The head immobilizer will keep the head and neck firmly in place while on the back board. You will also need to get the velcro straps for the spineboard which is a total strap system for a fast and firm immobilization. You don’t worry about records or recognition. You don’t have the time. As our protector in and around the water, you must focus on ensuring the safety of others, not the glory of yourself. You pay attention to your surroundings and are aware of anything that may seem even slightly out of place. TYR has constructed their Guard line with the same unwavering focus. The TYR lifeguard swimsuits feature the long lasting Durafast fabric which is designed to resist sun and chlorine damage while also staying colorfast and comfortable. With the TYR Guard suits, your focus can stay where it’s supposed to. On safety, not your equipment. The new TYR lifeguard suits are available for both women and men. The female styles include one piece lifeguard suits, 2 piece lifeguard suits, life guard cover up shorts, and lifeguard t-shirts. The TYR Microback Guard suit will give you the least amount of tan lines this summer while you are up on the guard stand. The TYR male guard styles include male guard shorts, lifeguard boardshorts, the popular TYR Guard Challenger Trunk, and male guard t-shirts. TYR has engineered their lifeguard line with the same advanced aquatic technology as their unbeatable competitive swimsuit line. As literal life savers, you deserve the best like long-lasting swimsuits with sun resistance and chlorine protection. Your local lifeguard just got stronger, faster, and way hotter. The new Speedo Lifeguard Collection features select styles in long-lasting Endurance fabric, quick drying Speedry watershorts, and sizzling styles that will save any long, hot, summer day. There are 12 female and 7 male styles to choose from in the new Speedo Lifeguard Collection. The female swimsuit styles range from the classic ultraback swimsuit to the racing Flyback and Super Pro back, to the two piece bikini swimwear styles. The male styles include short and long watershorts and the beach favorite the Lifeguard boardshorts. Including both a men and women’s line, the Speedo Lifeguard swimsuits feature the Lifeguard logo on each swimsuit, boardshort, and t-shirts. Available in the Endurance, Lycra, or Speedry fabrics the Speedo Lifeguard collection is designed to fit any budget and any body style.